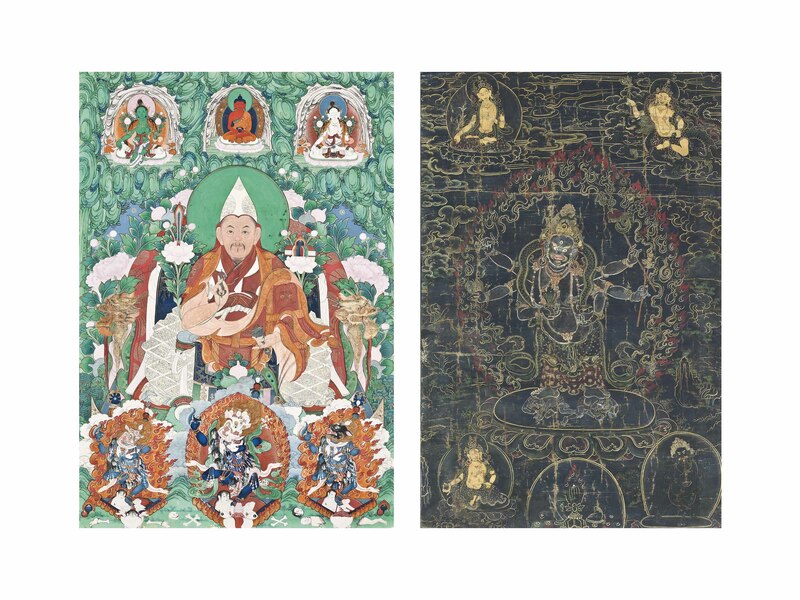 The Tibeto-Chinese thangka depicts a Hutuktu seated with crossed legs on a throne with his right hand holding the vajra and with his left the ghanta, clad in a monk's garments. The upper section is painted with Buddha Amitabha flanked by the green Syamatara and the white Sitatara, the lower part with Simhavaktra flanked by other animal-headed dakini's. The Tibetan black-ground thangka depicts Sadbhujamahakala standing in pratyalidhasana on a lotus base, his six arms radiating around his body while his hands hold the specific attributes.